Your podcast is born and spends the first 8 weeks of its life in New and Noteworthy on iTunes. It’s not alone, because on the same day four other podcasts are launched. You need to make an impression because you’re competing for attention. You need to be in the first 2 rows of New and Noteworthy for your category, which means you’ll be seen by tens of millions of people on iTunes. The iTunes algorithm will mainly determine where your podcast ranks in New and Noteworthy, but there is one variable that you have a lot of control over, and that’s obtaining Ratings and Reviews. I know. My podcast received 105 Ratings and 97 Reviews in the first 8 weeks. This helped propel the podcast into the first 2 rows of New and Noteworthy, and from there huge momentum was built. During the 8 weeks of New and Noteworthy it’s important to get as many Ratings and Reviews for your podcast as possible. The more you can get, the higher you’ll be ranked. Easy? Well, it depends because it means asking people to give your podcast a Rating and Review. They’re unlikely to come organically from your audience unless you’re well known. What usually happens is you ask family, friends, and colleagues to give you a Rating and Review on iTunes. They all say “sure”, but at the end of the day, some have, haven’t, or just plain forgot. That happened to me. The first 2 weeks were totally dismal, and I needed to take urgent action. I implemented a new strategy for weeks 2-8 to obtain as many Ratings and Reviews on iTunes as possible. After 4 weeks my podcast started ranking consistently in the top positions in all three of its categories in iTunes. On a daily basis, it gradually started appearing in the first 2 rows, or top 16 podcasts. By the end of the 8-weeks, the podcast had received 105 Ratings and 97 Reviews during the New and Noteworthy period in the US alone. I’ll show you how I did it, so let’s get started. There is work and planning that can be done prior to launching, so we’ll dig into that first. This is the period used to plan your 8-week campaign so when your podcast is launched you can hit the ground running. Firstly, make a list of people you feel comfortable contacting, requesting them to leave a Rating and Review once your podcast goes live. Tell them they’ll receive an email with instructions on how to leave a Rating and Review on iTunes for your podcast. It’s important to stress to people you’re not after a review that’s like a full book review. Just a simple review that could be words such as ‘great podcast’. Prepare the email so it’s ready to go once your podcast is approved by iTunes and you have the Podcast URL Feed. Start talking about the launch of your podcast on your Social Media platforms. 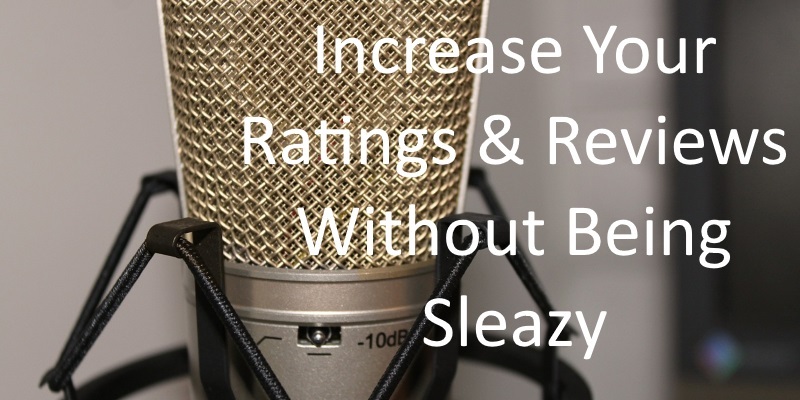 On your website, around the time of the launch, show people how to leave a Rating and Review for your podcast. Once you’ve got approval from iTunes, you’re on the dance floor. Now you can email your list of people with the iTunes link and instructions on how they can really help you by leaving a Rating and a Review for your show. Also, have a Call To Action (CTA) at end of each podcast for listeners to leave a Rating and Review on iTunes. However, an extra step is essential. To really increase the number of Ratings and Reviews, you’ll need to ask people that aren’t part of your immediate network. That can be difficult or awkward, but there’s an easy way to do it, and it’s called the Pay-It-Forward strategy. The most likely people to leave a Rating and Review for your podcast are other podcasters who also want their show Rated and Reviewed. This is the Pay-It-Forward principle. Basically, I Rated and Reviewed as many podcasts in New and Noteworthy as I could. I then contacted the people to let them know I had reviewed their podcast and asked them to review my podcast. Left a Rating and Review on iTunes. Took a screenshot of the Rating and Review I had left. Sent the screenshot of the Rating and Review to them, and at the same time asked them if they could Review my podcast. I reviewed about 25 podcasts each week for the remaining 6-weeks, and always ranked higher in my categories in iTunes compared to the previous week. After the 8-week period, I had reviewed a total of 147 podcasts and in return received 105 Ratings and 97 Reviews in the US alone. That’s an incredible conversion rate of 71.4%. You can increase your Ratings and Reviews to rank higher in iTunes by using the Pay-It-Forward strategy. It works brilliantly because other podcasters have the same objective. They will know that you’ve Rated and Reviewed them once you’ve forwarded the screenshot and a short message. Sending a message with a screenshot to the person whose podcast you’ve just reviewed and asking them to review your podcast is key. It not only demonstrates proof, but it’s likely to be reciprocated. The Pay-It-Forward principle is an actionable strategy you can implement today to dramatically increase your Ratings and Reviews. The result is a ranking higher in iTunes.